The porterhouse is the steak you order before you get the electric chair. “It’s big!” says Terry Condon, general manager of Gallagher’s Steak House in New York City. “You’re getting filet and sirloin, aka a strip, split by a bone down the center.” That makes for a lethal injection of meat. The most expensive and tender cut of steak is the filet because, unlike the rope swing at Janet Jackson’s house, it has very little fat hanging from it. “Depending on how thick you slice it, the filet tends to take longer to cook than other cuts,” Condon says. This steak is sometimes known as the New York or Kansas City strip, depending on the side of the Mississippi from which you hail. “The sirloin can be served bone in or out,” Condon says. “And it’s a more tender cut.” This area on the cow doesn’t build up that much muscle. Just like you. 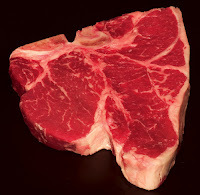 The T-bone is like a porterhouse, but with a smaller filet and a bone across the top. “It’s a difficult cut to choose,” Condon says. “The two pieces can be inconsistent.” Your juicy filet could be complemented by a sirloin so veiny you’d swear it came off of Grandma.